better than the BS model. and the governors of EU are trying to solve the problem. tion if we focus on the short term or daily. model is the volatility smile which is shown by  etc. some performance issues. Section 5 is our conclusion. is the drift controlled by the investor sentiment. tion probability density except for this special case. log 1Nt 1N, the right tail fit. Figure 1. QQ-plots for log returns of Nikkei 225 index. Figure 2. Left and right tail plots for Nikkei 225 index. must be positive and that . the final nodes to the initial node . (OTM) if 0.97SK, in-the-money (ITM) otherwise. followed by the standard errors in the parentheses. notes an average of in the sample period. volatility becomes larger and larger as time passes. Table 1. Estimated parameters and in-sample fit. denotes the volatility of the BS model. money options are relatively long maturities. model is generally better than that of the BS model. 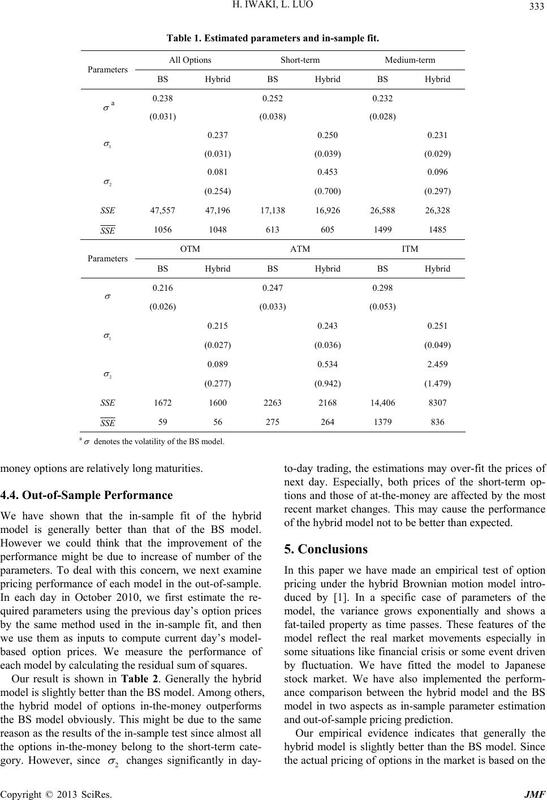 pricing performance of each model in the out-of-sample. each model by calculating the residual sum of squares. of the hybrid model not to be better than expected. Table 2. Out-of-sample pricing errors. motion in the near future. 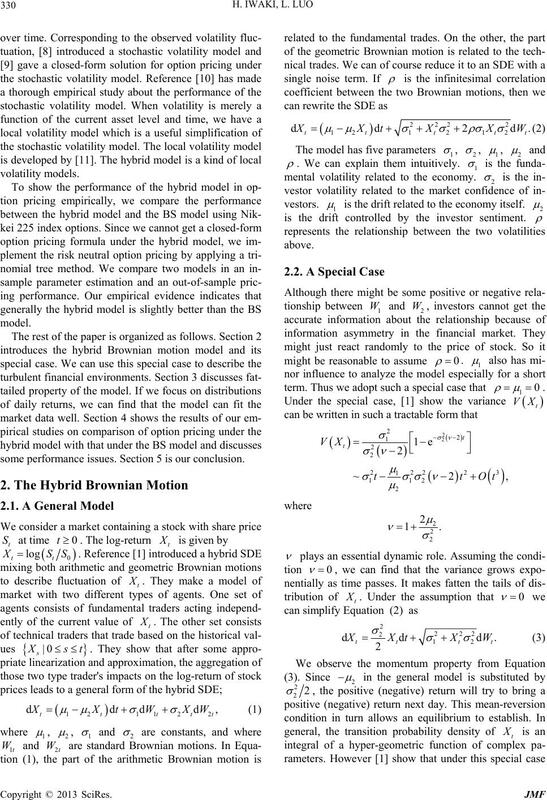 Prices,” Journal of Business, Vol. 36, No. 4, 1963, pp. 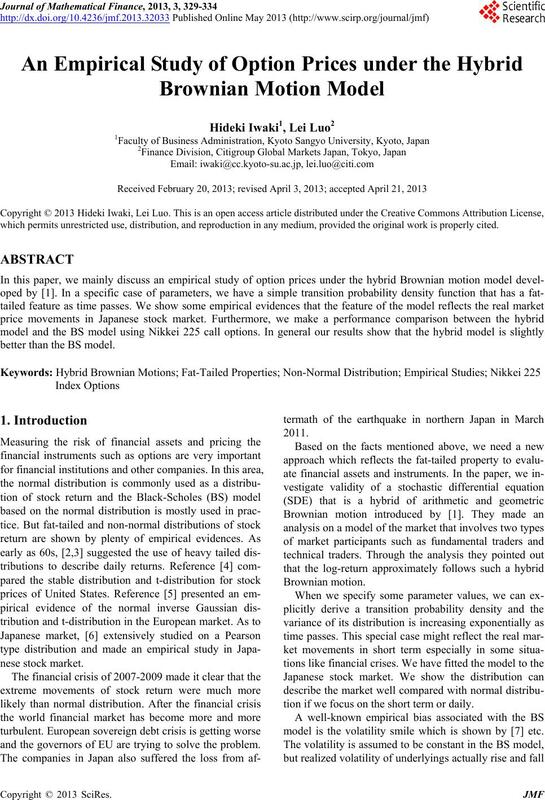 Journal of Business, Vol. 38, No. 1, 1965, pp. 34-105.
nometrics, Vol. 4, No. 2, 2006, pp. 275-309. Pacific Financial Markets, Vol. 3, 1996, pp. 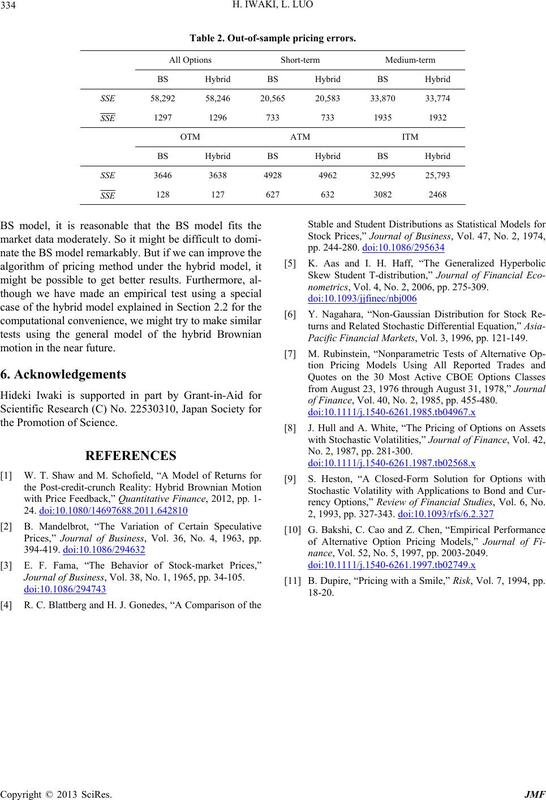 121-149.
of Finance, Vol. 40, No. 2, 1985, pp. 455-480. No. 2, 1987, pp. 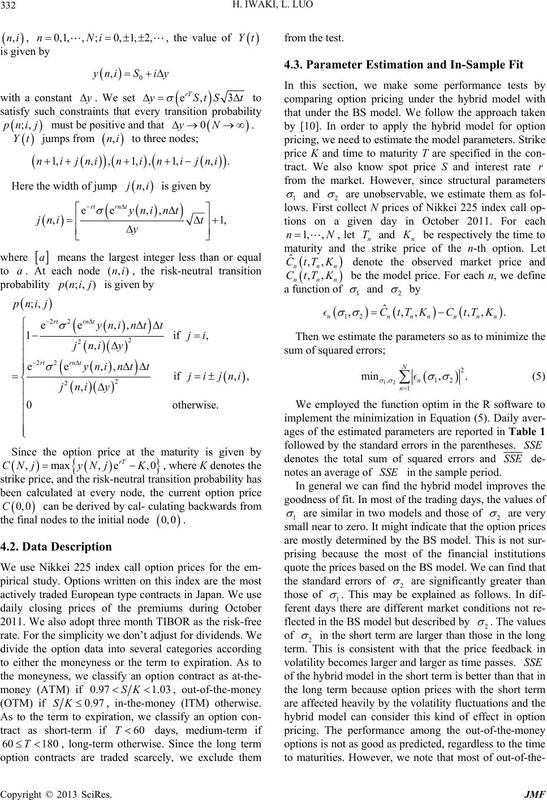 281-300.
rency Options,” Review of Financial Studies, Vol. 6, No. nance, Vol. 52, No. 5, 1997, pp. 2003-2049. 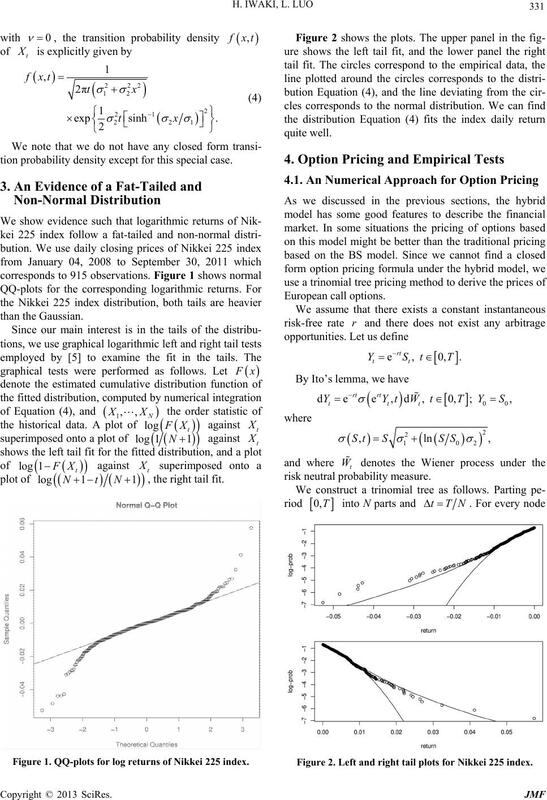 B. Dupire, “Pricing with a Smile,” Risk, Vol. 7, 1994, pp.